Only use this term to tag Knowledgebase pages that provide broad introductory information unrelated to any specific section. The Knowledge Base is an online resource that aims to summarise the extensive information around next-generation broadband in the UK, to assist those developing broadband projects. 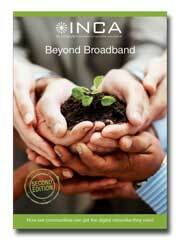 It builds on INCA's very successful Beyond Broadband guide published in late 2010. There is a commenting facility at the bottom of each page. Feel free to provide constructive comment on any aspect of this publication; help us to identify gaps in the content, update information, correct errors and create clarity whereever possible.